The M4 Mini DLP Projector from Apeman is a stylish and easy-to-use mini projector that can be carried in your pocket. If you want to stream some video from a device with HDMI output without any hassle, this little guy is here to help you. Read on to find out what we thought of it. When you first open the box and take off the protective tape, you’ll be awed by the looks. The black shiny surface and minimalistic design really set this device apart. However, it comes with a price–your every touch will be left on the surface. On top you’ll find an LED charge indicator, while the rear side houses the various ports. The power button, volume control, and focus dial are the sides. It was a nice surprise to find a small tripod in the box. It’s easy to use and gives the projector a firm stand. The mini tripod gives you the freedom to rotate the projector 360 degrees. However, don’t tilt the device, since there’s no keystone controls to correct distortion. With a full-size HDMI port, the Apeman M4 is compatible with nearly any standard media device. But at the same time, there’s absolutely no wireless connectivity–no Bluetooth, nor Wi-Fi–so connecting a smartphone is trickier. It’s possible, but you’ll need to use an intermediary device like a Roku stick or ChromeCast Chromecast Ultra vs. Apple TV 4K vs. Roku Ultra vs. Amazon Fire 4K: Which Is Best? Chromecast Ultra vs. Apple TV 4K vs. Roku Ultra vs. Amazon Fire 4K: Which Is Best? Which 4K streaming device should you buy? Let us help you decide between the Chromecast Ultra, the Apple TV 4K, the Roku Ultra, and the Amazon Fire TV 4K. Read More . Thankfully, there’s a full size USB port as well, which can provide power for your media player if needed. It is odd to see a modern device that has no software interface at all. I was expecting some settings or brightness etc. But when you turn it on, you won’t see anything but the Apeman logo (and “No signal”, if there is nothing to project yet). There’s no screen adjustments, no keystone settings: what you see is what you get. This mini projector is really easy to use and works straight out of the box. It even ships pre-charged. Just hold the power button for a couple of seconds until the charge indicator flashes on and the Apeman logo will be projected on the wall. At 50 to 100 lumens (as stated by Apeman), the M4 mini projector needs completely dark room, ideally. I wouldn’t recommend using the projector in any kind of daylight. The ideal distance between the projector and the wall is about two meters. The closer the better, but at one meter or less, the purpose of even using a projector becomes unclear. After finding your best distance, setting up the mini tripod and manually focussing, you’re ready to watch a movie. As mentioned, you’ll need a streaming media stick of some kind if you want to cast from a smartphone How to Mirror Your Android Device to Your TV How to Mirror Your Android Device to Your TV Yes, you can watch anything that's on your Android device on a TV, with and without a wire. Read More . Just plug the stick (Roku in our case) into the HDMI port at the back of the projector, and you can use the projector’s USB port for power. You can even use it to charge your phone if you’re desperate. At full charge, the built-in battery allows you watch a two-hour movie without having to keep the power cable plugged into the projector. Once the battery is drained, it will take about 4 hours to charge it. Surprisingly, the fan inside the projector is pretty quiet. The built-in speakers are loud and clear enough for a small room, but very tinny. If you have an external speakers, I’d definitely recommend using those instead. External speakers, or headphones, can be plugged into the 3.5 mm audio jack located at the back of the projector. At about two meters from the wall, in complete darkness, the image quality is decent and comfortable on the eyes. Even though its native resolution is only 854 x 480px, it supports 1080p video input and will downscale it. The resolution sounds disappointing, but bear in mind that it’s actually a little higher than DVD quality. Remember DVDs? They weren’t all that bad, were they? For best experience, find a white flat wall, because a textured surface will cause blurriness and you won’t like the result. The throw ratio is 1:1, which is simple to explain. To get a 100″ diagonal projection size, you would need to place the device 100″ back from the screen. At only 3.86 inches square and 0.85 inches thick, the palm-sized M4 mini projector can be carried in your pocket. Albeit, fairly big pockets. If you are planning a movie night in your backyard, you will need to bring a laptop with HDMI output in case if you don’t have a proper adapter for your smartphone or a streaming device. It would be much better if the projector supported reading from a storage like an SD card or a thumb drive, but it doesn’t have any memory slot to read from, the USB port is strictly for power. The M4 Mini Projector is not here to replace your home theater, but if you’re looking for a tiny and easy-to-use projector for fun, it’s a good match. 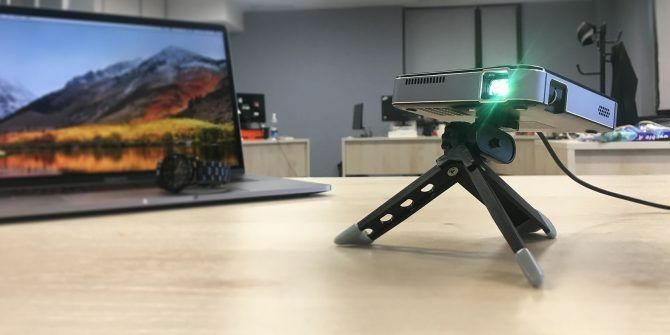 If you need something brighter, with a bigger battery life and built-in streaming capabilities, check out the Nebula Mars Nebula Mars Review: This IS The Portable Projector You're Looking For! Nebula Mars Review: This IS The Portable Projector You're Looking For! Portable projectors generally aren't great: poor image quality, not bright enough, rubbish speakers, and barely enough battery to last a whole movie. But the Nebula Mars sets the new standard. Read More instead (at around two to three times the price). Our friends at Apeman have kindly provided a brand new M4 Mini Projector to give away. All you have to do is enter our giveaway contest below, and make sure you follow the instructions to gain some extra entries. the tripod is a rip-off from pedco's ultrapod. Wow this look real compact and portable. You do not necessarily need a streaming stick to route video from a smartphone; many phones can actually output HDMI directly with an appropriate adapter.